A driver waits to make a right turn out of a parking lot onto the Post Road. FAIRFIELD — Having several thriving business districts is not normally considered a bad thing. But what happens when traffic to and from those destinations seems to overwhelm local streets? Traffic is a common complaint among Fairfield residents. 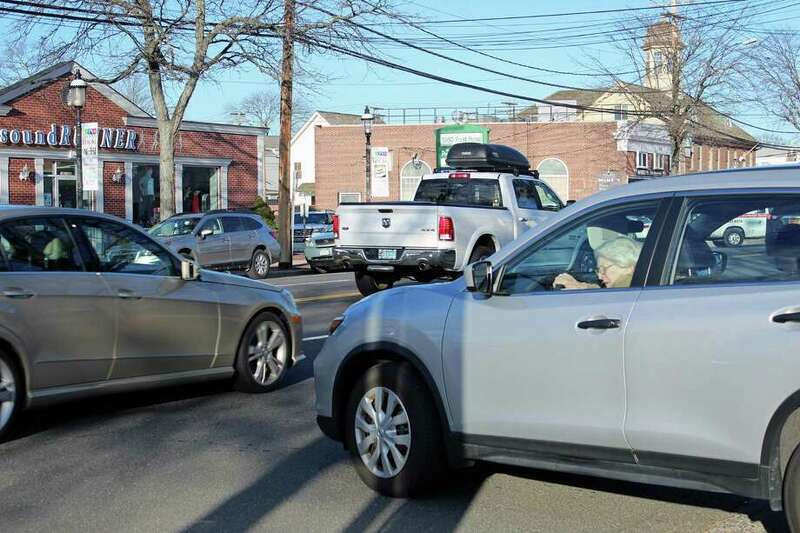 Many have their own workaround to avoid those chronic areas, whether it’s Black Rock Turnpike or the Post Road, and now, much to neighbors’ chagrin, mobile apps like WAZE send motorists off on local roads to escape traffic tie-ups. Tetreau and Representative Town Meeting Deputy Minority Leader Michael Herley, R-10, raised the issue of expanding the town’s commercial base recently — Tetreau in his State of the Town address, and Herley in the GOP’s response. According to Herley, the town’s traffic and parking issue will only deter commercial developers from wanting to locate here, and he puts what he said is a lack of any adequate planning at the feet of the Tetreau administration. Tetreau said the town has actually been involved in many different planning or projects, including the study of Black Rock Turnpike that is underway and seeks ways to improve safety for pedestrians, bicyclists and motorists. He said there are “major” sidewalk improvement projects around the Fairfield Metro train station to encourage and help people use mass transit, along with a major planning study for pedestrian and traffic improvements from the Post Road circle to Black Rock. A transit-oriented district planning project was recently begun for the Metro Center and downtown train station by the Economic Development Commission, and Tetreau said town officials encourage transit-oriented development, like Trademark Fairfield next to the Metro Center. “This is centered around transportation hubs, reducing traffic congestion,” the first selectman said. Herley’s suggestions include widening intersections, adding a parking deck at the downtown train station, and more parking spaces along the Post Road in Southport. Residents of Mosswood Condominiums most recently raised objections to solar panel carports at the train station, and plans were dropped. Many years ago, they objected to a parking garage at the train station. “This project has been looked at a number of times,” Tetreau said, saying a suggestion such as Herley’s raises questions about who would pay for it. He also said there is a concern about how many spaces are actually added once lost spaces for support columns and ramps are subtracted. There was an effort to get downtown employees and commuters to use town spaces at a Mill Plain Road lot, but it was not well received. As for the Post Road in Southport, Herley said he’s been urging the town to remove “no parking” signs that run from Twice As Nice up to the beginning of Garelick and Herbs. “This would immediately add close to 20 parking spots to the area in the shoulder lane,” he said. Herley said by adding crosswalks at the intersection of Hulls Highway and Center Street, those who park on the northbound side of the Post Road near Twice As Nice can safely cross the Post Road. The town has an application pending for a $200,000 state Responsible Growth and Transit-Oriented Development grant, which would be used to develop a “complete streets” improvement plan, including the Post Road south from the Exit 19 ramp to the Westport town line. The major arteries in town, like the Post Road, Black Rock Turnpike and Stratfield Road/Easton Turnpike, are also state roads. Changes to those roads have to first be approved by the town’s traffic authority, in this case the Police Commission, and then it is forwarded to the state, which can either endorse the change if it complies with the Manual on Uniform Traffic Control Devices, or get the town to change its mind. With items like traffic lights, the state may decide that it must be maintained by the town. He said the DOT just denied an application to make Hulls Highway at the Post Road no turn on red, despite widespread community support. “Engineering supported it and it had the blessing of the Police Commission,” Herley said. “I think what’s important here is that the local RTM reps work to support the first selectman and build support with our state delegation, who are in a better position to push” the state on these projects. But is it bumper-to-bumper traffic all the time in Fairfield, or is that more of a perception? Some congestion, Wendt said, in the downtown and major commercial corridors is a sign of healthy business activity. “That said, we are engaged in a major traffic corridor study for Black Rock Turnpike,” he said. Motorists traveling through downtown might feel they are waiting a bit longer at traffic lights, but that’s not necessarily because of volume. Some crosswalk signals have been updated to include a pedestrian phase, which provides more time to cross the street. It’s also a possibility there are more town residents who are driving. In 2017, there were 48,147 cars registered in Fairfield, according to the Tax Assessor’s Office. Census data shows in 2016 there were 20,155 occupied households, with a population that totals 61,114. There are 46,056 people over the age of 18, and 14,539 households with two or more cars.